City staff and residents can quickly learn public safety information, mass transit features, and more. Key location-based information helps staff respond to public safety events quickly. With the new mapping application, incoming 311 calls were reduced significantly. Situated on the mid-Atlantic coast, Baltimore, Maryland, is representative of many US cities with an urban core (population of about 620,000 in 80 square miles) situated within a larger metropolitan area. IndyCar racers on the Baltimore Grand Prix circuit. Unlike other cities, Baltimore offers the thrilling experience of watching racecars speed down its streets each Labor Day Weekend. 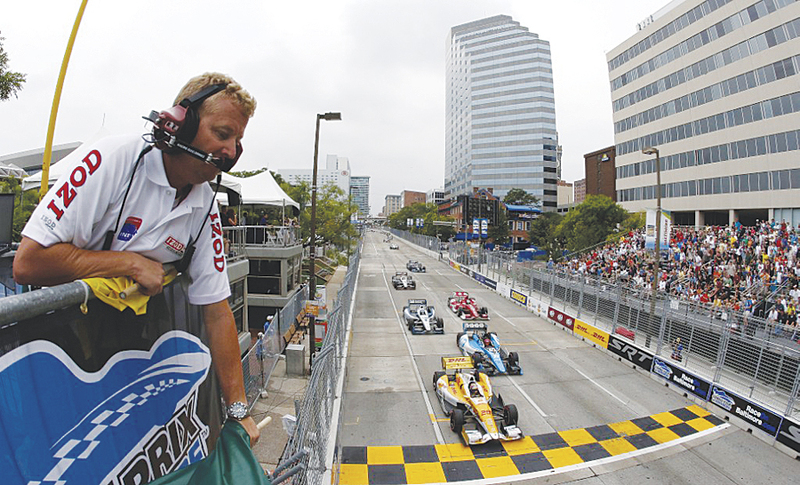 The Grand Prix of Baltimore, presented by SRT (a high-performance automobile group within Chrysler LLC) was first held in 2011. This IndyCar Series and American Le Mans Series event runs on an interim street circuit around the Inner Harbor. Yet, even as this event excites and delights, public safety is an issue that must be first and foremost for city officials. During the 2012 Grand Prix, a new easy-to-use web mapping application had been introduced and helped race organizers and public safety officials communicate important information to race enthusiasts like street closures and medical and security locations. Fans were able to map and find directions to the starting line, the pit lane, parking, gates, paddock areas, shuttle stops, and bike parking zones, plus nearby hotels and restaurants. The mapping application was the result of city officials understanding that with the need and demand for real-time digital information becoming more prevalent than ever, the city needed an application built to deliver a find-it-yourself capability for Baltimore’s municipal website that addressed citizen and visitor demand for relevant and important location-based information. Called CityView, the application was a collaborative effort between the City of Baltimore and Esri Silver Partner Applied Geographics, Inc. (AppGeo), of Boston, Massachusetts, with the intent of keeping citizens and visitors alike informed and safe at all times. The city fields thousands of calls daily not only about special events like the Grand Prix but also routine citizen questions about trash pickup, snow routes, polling places, and other topics handled by different departments. A common denominator of these calls is that they relate to specific places within the city. Baltimore’s vision for its mapping application was to provide specific constituencies (residents, businesses, visitors) with location-based information regarding public safety, city life, and special events tailored to their needs. Residents and visitors now have an easy way to find out where the nearest police station, fire station, or hospital is or where the nearest evacuation center is should yet another superstorm reach the East Coast. By creating the Grand Prix street circuit map, Baltimore helps residents, visitors, businesses, and city staff enjoy this annual event. Users can go directly to specific addresses, locations, or neighborhoods, or they can identify as a resident, visitor, or businessperson looking for information about a particular topic. For example, one could identify as a resident of the Inner Harbor and then select a specific subtopic—public safety, weather, or planning—and quickly and accurately find if they are in a floodplain, the latest track of an approaching hurricane, and nearby evacuation shelters, or one could identify as a visitor, select the subtopic “stadiums,” and find the quickest route to Camden Yards. The results are displayed on a map and in a list that provides links, driving directions, and other useful information. Users can also download the results to a spreadsheet or share the map via e-mail. Public safety information is also available on the splash page and through an Alerts function that are updated by the city in response to events. For example, when temperatures exceed 90 degrees or during extreme cold temperatures, the city updates these links to notify citizens on the locations of cooling or warming centers, plus contact information, intake hours, and capacity. Alerts delivered through the website might identify closed streets due to a water main break or show residents where the potential flood areas are during catastrophic storm events and where vehicles should be moved. Since its launch, Planning Department staff use the application as a quick property reference, and they frequently refer callers to the application. City planner Jamie Williams has noticed a significant reduction of phone calls to her office, particularly multiple requests from the same citizen, providing verification that the application is getting repeated use and is meeting the need for self-service information. In 1996, Baltimore was the first US city to introduce the 311 phone number for residents to report nonemergency situations like potholes or graffiti. Floodplain information layered over a map of the Inner Harbor. 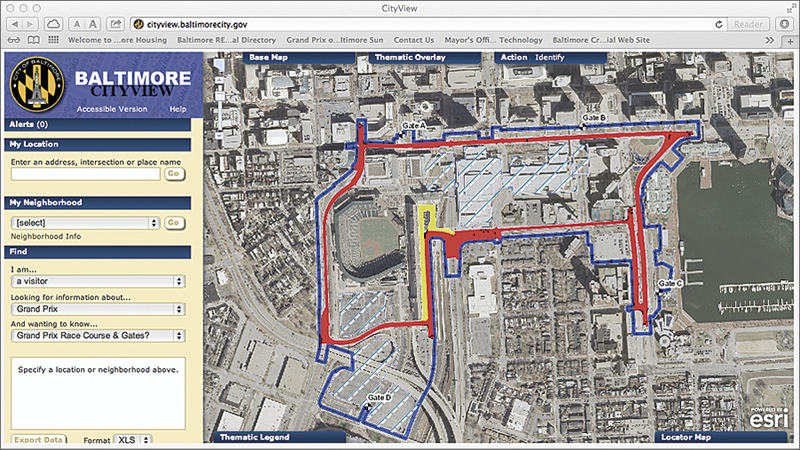 Today, Baltimore 311 relies on CityView more than any other city department. Employee Sharron Rosenbaum noted that Baltimore 311 takes about 3,000 calls a day. The 311 Call Center agents use the application to respond to callers’ questions, verify locations, and determine service information. The application makes it easy for 311 staff to enter the location of interest by street number/name, intersection, or a common place (e.g., City Hall). Om Poudel, application developer with the EGIS, studied CityView website traffic and found that it increased significantly in the first six months of 2012. Currently, daily hits average 500 during the workweek and 300 on weekends, equaling hundreds of fewer calls to Baltimore 311 every day. He attributes the steady traffic to the fact that EGIS staff continuously adds new layers or updates in response to user demand. Plus, CityView links appear on several of the city’s web pages, such as the small business development website that provides a hyperlink to the application and automatically populates the search fields based on where the user was within the website. In the Bureaus of Solid Waste and Water and Wastewater, staffer Amanda Huber explains the application enables staff to assist residents with their trash and recycling collection days and differentiate between a missed collection and items that were mistakenly set out on the wrong day. The application is also used in outreach efforts, like advising residents who to contact for programs like the Community Pitch-In, a community cleanup event. Huber also says staff use the application to quickly determine property information, mass transit and other transportation features, locations of businesses and city services, and historic districts and landmarks—key location-based information that helps staff do their jobs more efficiently. The city also understood that users of the site would need access to a variety of basemaps to provide context for their questions. Esri’s Community Basemap, Esri Streets, and Light Gray Canvas basemap options are available, as well as aerial photography, Bing Streets, Bing Bird’s Eye, and more. Switching among basemaps is easily done from a drop-down menu. The user has control over the transparency of basemaps and the thematic maps that overlay the basemap, and city staff can easily add new basemaps. For more information, contact Samantha Luckhardt, EGIS supervisor, City of Baltimore, or Mike Blake, PMP, senior project manager, AppGeo. 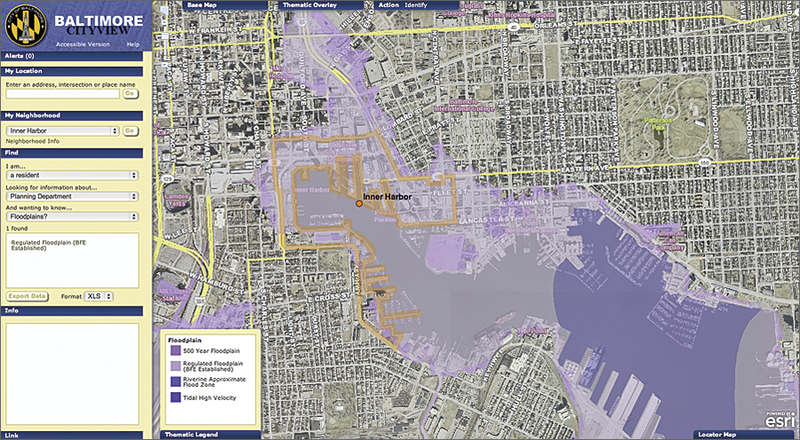 In 2012, the Public Technology Institute recognized Baltimore’s CityView with an award for GIS Significant Achievement.